Parking on the southeast section of campus has been an issue for many years not only because University of Alabama students, faculty and staff use surrounding academic buildings, but also because events are held at Coleman Coliseum, Sewell-Thomas Stadium and the Bryant Conference Center. To alleviate the parking issue and provide services for the campus community and visitors, UA is constructing the Capstone Parking Deck, which will add approximately 1010 parking spaces to this active area of campus. Aside from parking spaces, the deck will include several unique features. In addition to a Best Available Refuge Area, which is standard in many parking decks on campus, it will house UA’s new Event Management Center. The center will provide the UA Department of Public Safety with the appropriate space to monitor and manage campus events. The structure also will support the Million Dollar Band by providing restrooms plus storage and shelter spaces near its outdoor practice field. As construction continues, crews will make improvements to the pedestrian crossing and intersection at the parking deck’s entrance on Second Avenue. These improvements will make the area safer for pedestrians and enhance traffic flow. 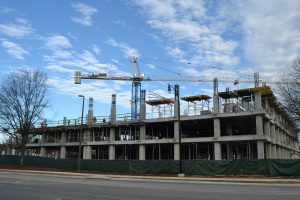 The Capstone Parking Deck is scheduled to open in August.